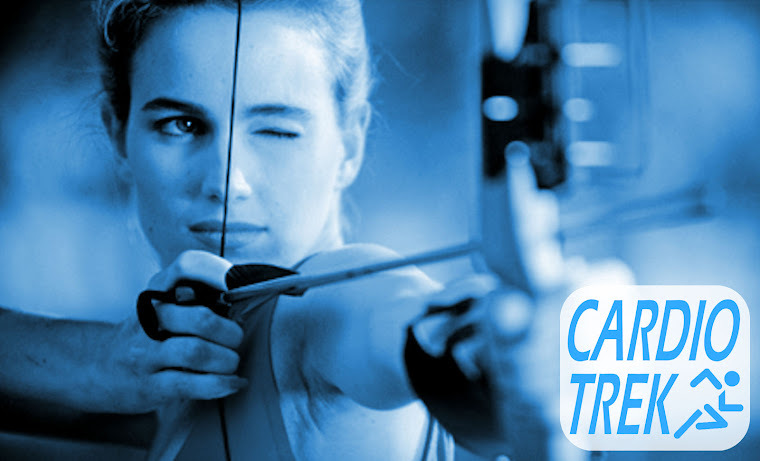 To excel at archery you really have to become in tune with your body and learn from your mistakes. 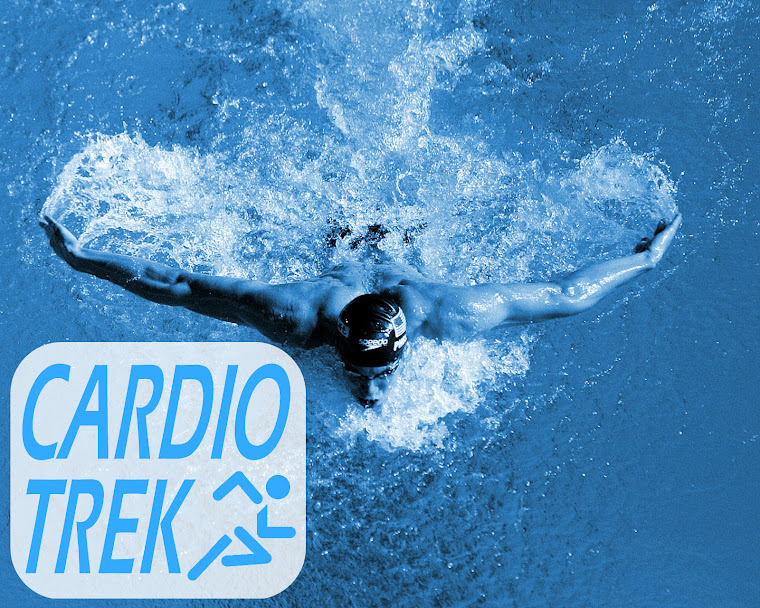 This requires a level of fitness, a level of physical self-awareness, a level of self-control, and a level of patience/perseverance otherwise you will give up before achieving the first three. 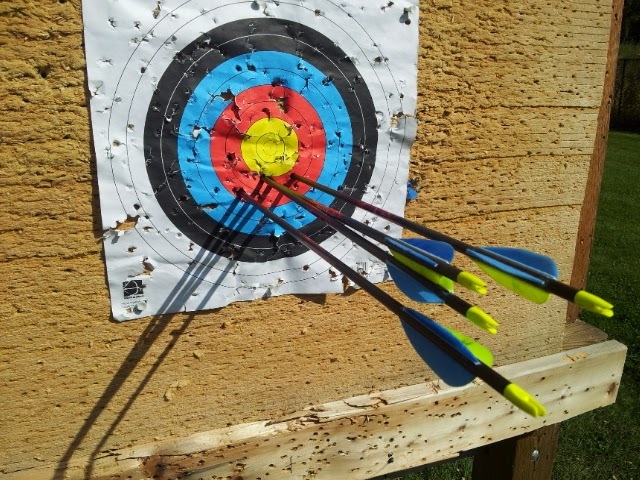 Beginner archers need to push themselves to hone their form so they make clusters of arrows. 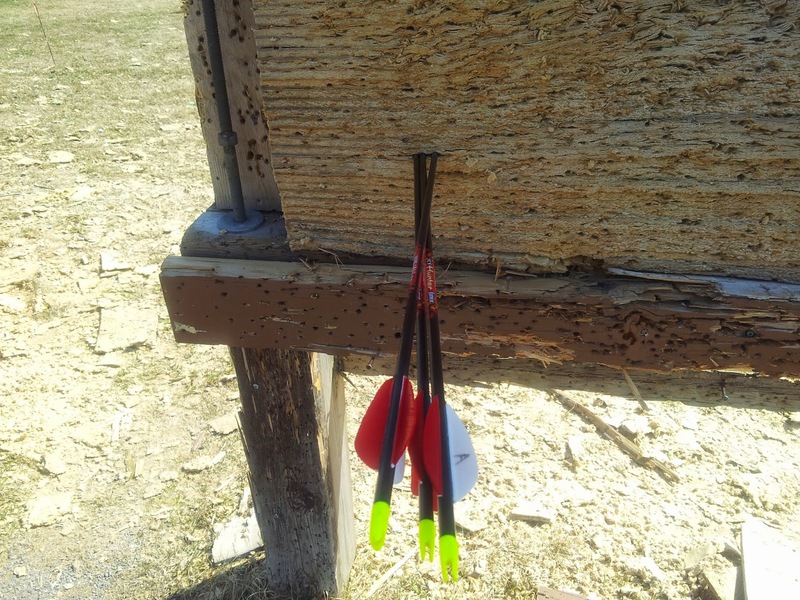 It is not so important to hit the proverbial 'bulls eye', what matters more is whether you can get your arrows in tight clusters. Hitting the bulls eye can sometimes be dumb luck. 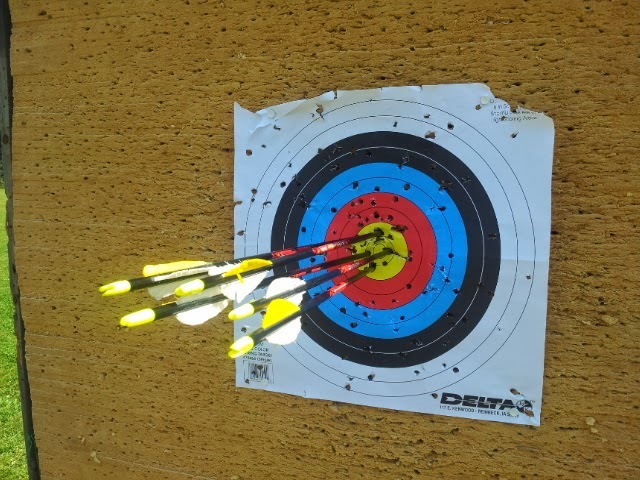 Below is a photo of an arrow cluster on a moving target - but to achieve that level of accuracy the archer first needs to make a cluster on the target, and then the following round adjust their aim, all the while maintaining perfect form or at least the necessary level of form required to hit whatever it is they are aiming at. 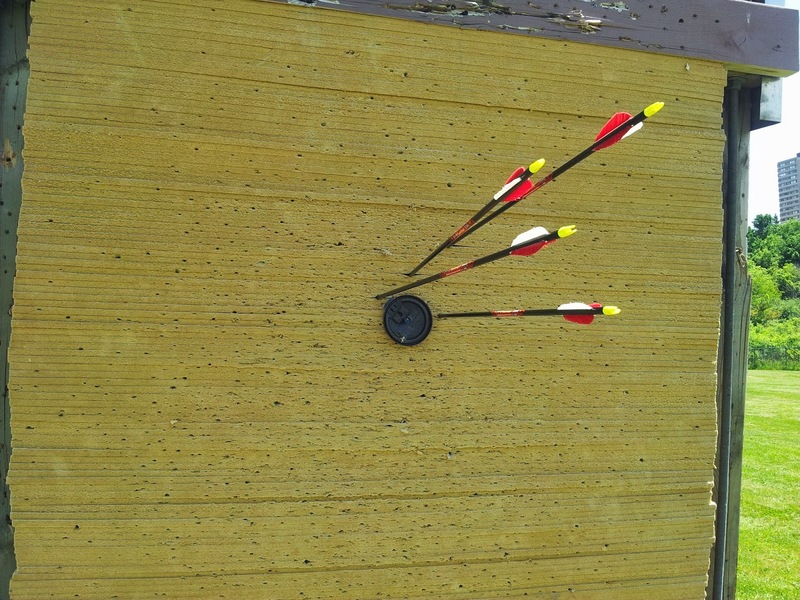 A minor form mistake could send their arrow too high, too low or to the left or right. 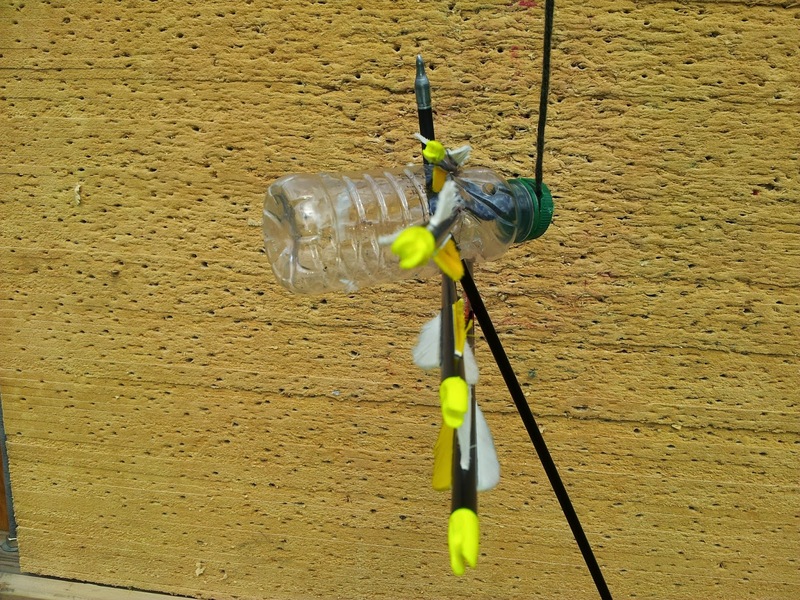 In the photo below is an example of an arrow cluster on a 40 cm target. The total score is 49 points out of 50. 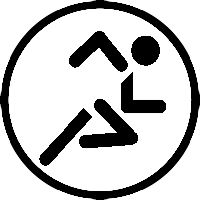 But this 'timbit sized' cluster on the yellow is the result of multiple rounds of carefully adjusting one's aim while simultaneously attempting to maintain perfect form despite heat, fatigue and other factors. In the photo below is an example of one such arrow cluster - smaller than a doughnut, but was aimed too low, and you will note is basically just a left-right line (a shelf) because the wind was shifting in different directions. Had the wind been calmer we might have seen a super tight cluster on the red directly below the yellow. 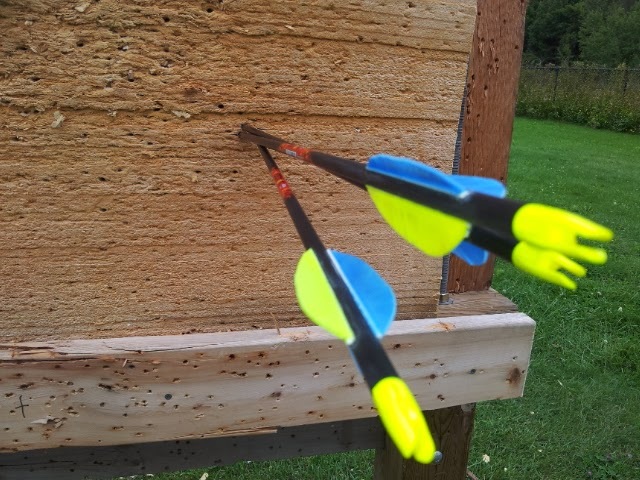 In the photo below is an example of 'cluster shooting', during which the archer is no longer attempting to hit a target per se but instead is focused solely on shooting tight clusters. As you can see the arrows are so tight together they are all touching. The one arrow below which is slightly askew even bumped the nock on one of the arrows above. Below is another example of a super tight cluster, this one is a line going left-right. 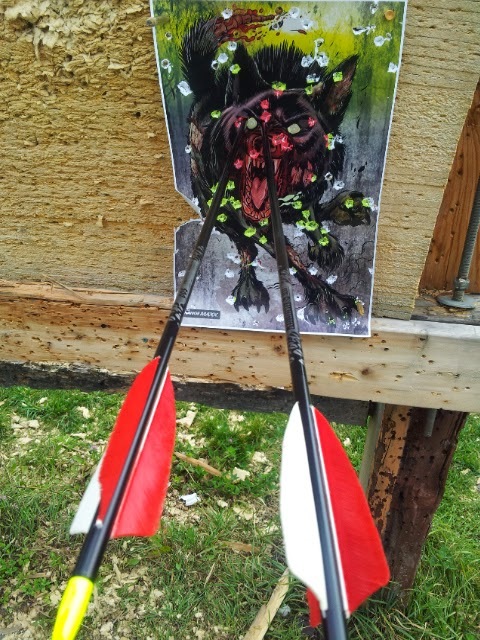 Having mastered the art of making super tight clusters a more advanced archer can then hone their aim by making clusters on specific parts of a target, like these two shots on the zombie wolf's eye. Or perform amazing feats of archery - like shooting a moving target - and then Robin Hooding your own arrow on the now pinned moving target. Or splitting an arrow on a moving target. 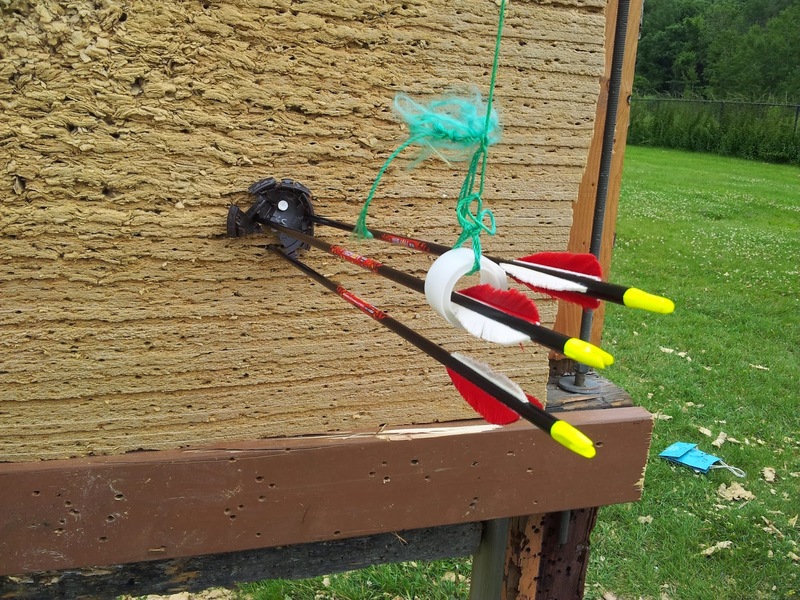 Conclusions - You really need to master your archery form to achieve any level of accuracy. 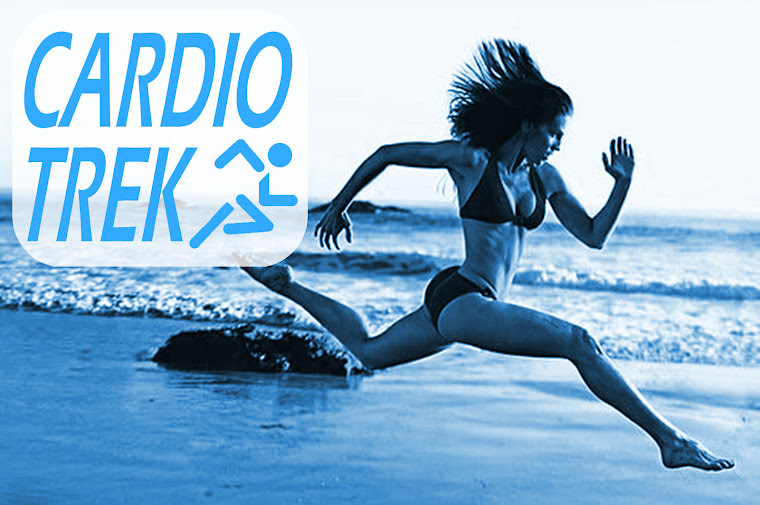 The better your form, the tighter your clusters are. Adjusting your aim is the easy part once your form has been perfected. 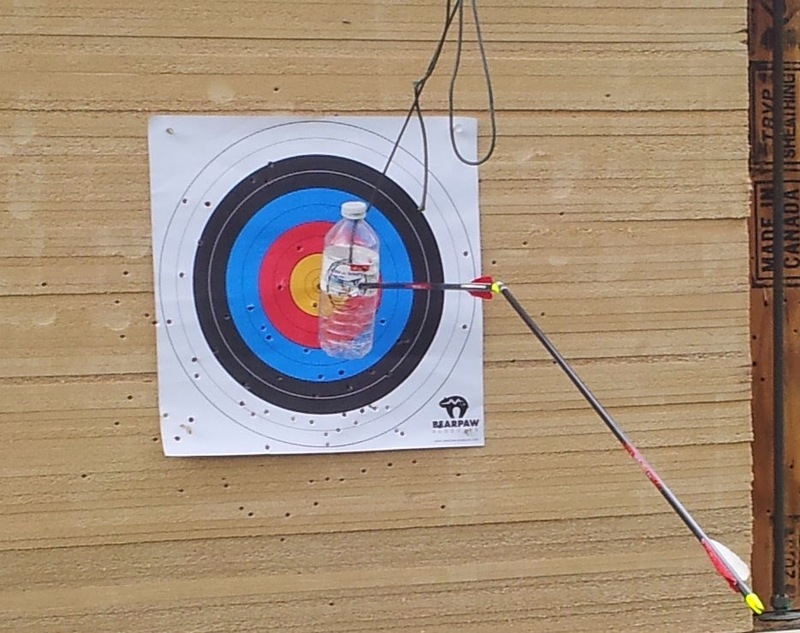 Even learning to adjust your aim for wind conditions is easy once you've developed excellent form.